Calls for closer connections among disciplines can be heard throughout the world of scholarly research, from major universities to the National Institutes of Health. In Defense of Disciplines presents a fresh and daring analysis of the argument surrounding interdisciplinarity. 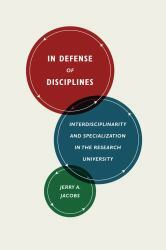 Challenging the belief that blurring the boundaries between traditional academic fields promotes more integrated research and effective teaching, Jerry Jacobs contends that the promise of interdisciplinarity is illusory and that critiques of established disciplines are often overstated and misplaced.Drawing on diverse sources of data, Jacobs offers a new theory of liberal arts disciplines such as biology, economics, and history that identifies the organizational sources of their dynamism and breadth. Illustrating his thesis with a wide range of case studies including the diffusion of ideas between fields, the creation of interdisciplinary scholarly journals, and the rise of new fields that spin off from existing ones, Jacobs turns many of the criticisms of disciplines on their heads to mount a powerful defense of the enduring value of liberal arts disciplines. This will become one of the anchors of the case against interdisciplinarity for years to come.